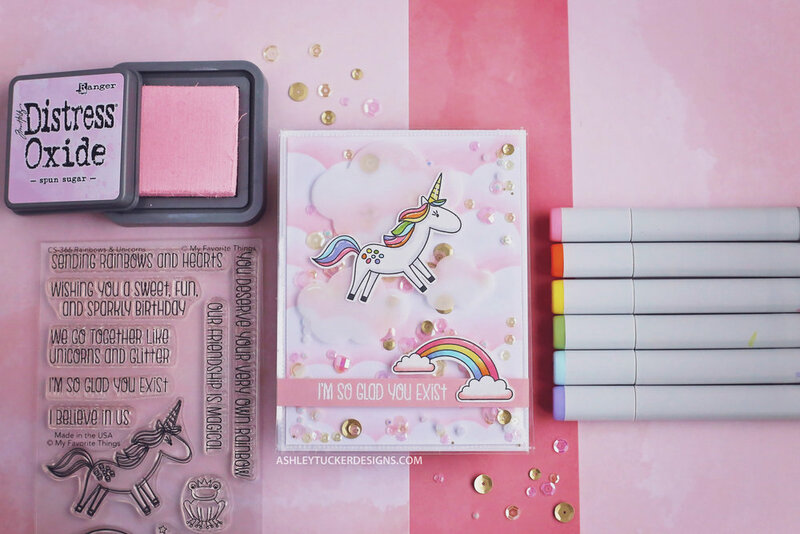 Today I am using one of the new stamp sets from Simon Says Stamp’s Fresh Bloom release! First I stamped the tree from the Blossoming stamp set onto some Neenah Classic Crest Solar White cardstock with Gina K Amalgam ink. I then colored in the image with Copics and fussy cut it out with scissors. I created a background panel by blending some Distress Oxide inks onto some Bristol Smooth paper. I blended the colors Spun Sugar and Worn Lipstick. I then used my fuse tool to turn the background into a shaker pocket. I used large clear glitter and clear micro pearls from my shaker bits. I adhered the shaker pocket onto a card base and then glued the tree onto the pocket. For my sentiment I embossed one of the stamps with white embossing powder onto Simon Says Stamp Slate cardstock. I popped the sentiment strip onto the card with foam tape. For the finishing touched on the card I first randomly added dabs of Glossy Accents to the flowers on the tree and sprinkle Unicorn Dust glitter onto them. I then used a white gel pen to add highlights and details to the tree. Finally I went over the sentiment with Wink of Stella glitter. Today I created shaker cards using a Fuse Tool with some awesome (and easy) watercolor backgrounds. To create the background I added the paint directly to my glass craft mat and then smooshed some Canson watercolor paper into it. I was able to make a ton of background really quickly with this technique and I think they all look really cool. Next I used my fuse tool to create a pocket around my backgrounds. For the plastic I used some old scrapbooking sleeves I had in my stash. I fused three sides and left one open to add my shaker bits. Once the sequins were inside the pockets I fused up the last side to finish the shaker pocket. I took the Happy Birthday stamp from the Beautiful Flowers stamp set from Simon Says Stamp and I heat embossing it with Alabaster embossing powder onto a strip of vellum. I then wrapped the vellum around the shaker pocket and adhered it to the back. I added a second smaller sentiment from Simon’s Tiny Words stamp set below the vellum one. I adhered both of my shaker pockets to A2 size card bases. To finish them up I added some white sequins which I then filled with Glossy Accents. Welcome friends! 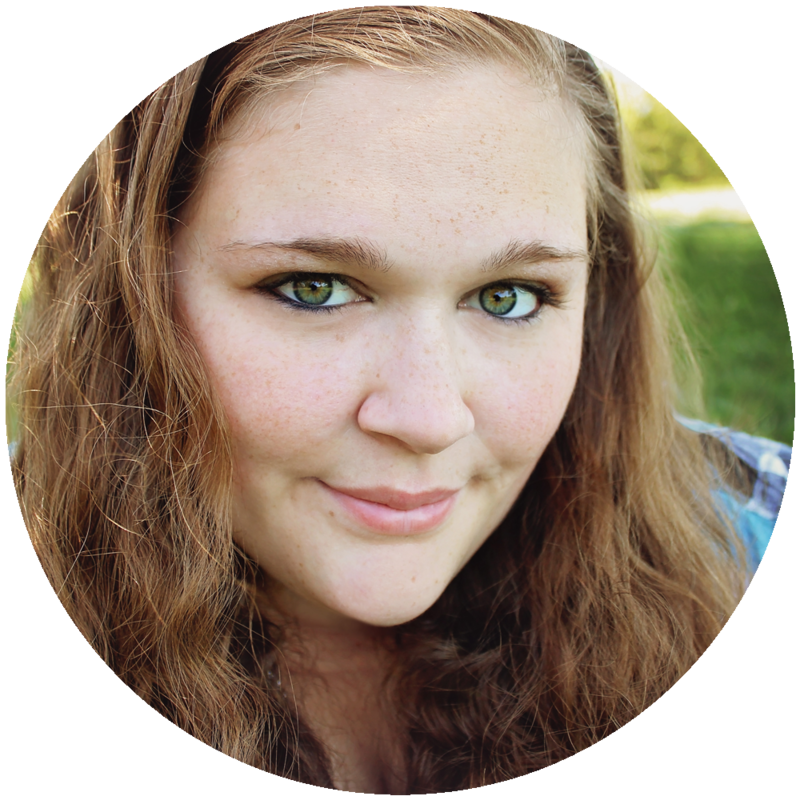 I am sharing a really fun project today for the Brutus Monroe blog hop. 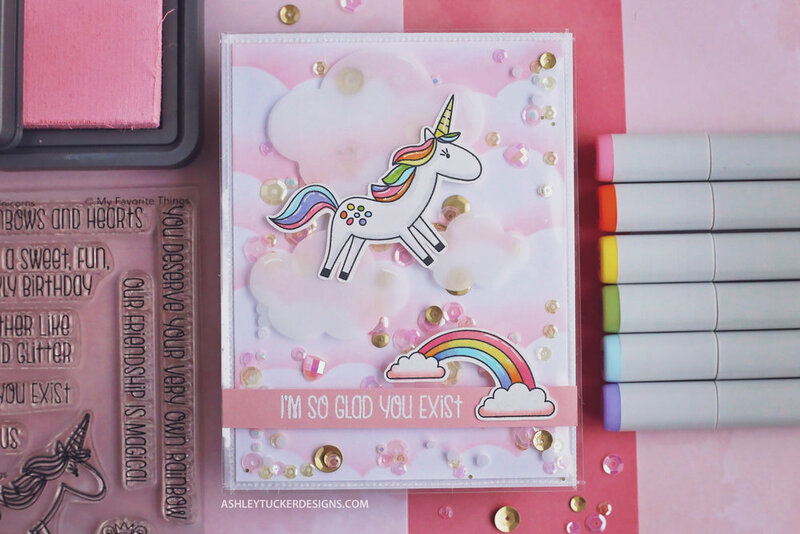 This blog hop is all about ATCs or Artist Trading Cards. These are small (2.5in x 3.5in) cards that you “art” on and then trade with fellow crafters. For my ATCs I started with a few pieces of watercolor paper. I then added drops of Aqua Pigment paint to my glass mat and dragged the paper through the paint. I really like the ethereal look that this created. I cut down the watercolor panels so that I had nine ATCs all together. I then used a fuse tool in order to turn them all into shakers. The plastic that I used for the shakers is actually just scrapbook page holders. I used a variety of different sequins to fill the shakers. In order to get the sentiments stamped in black onto the shaker plastic I used Staz-on ink. 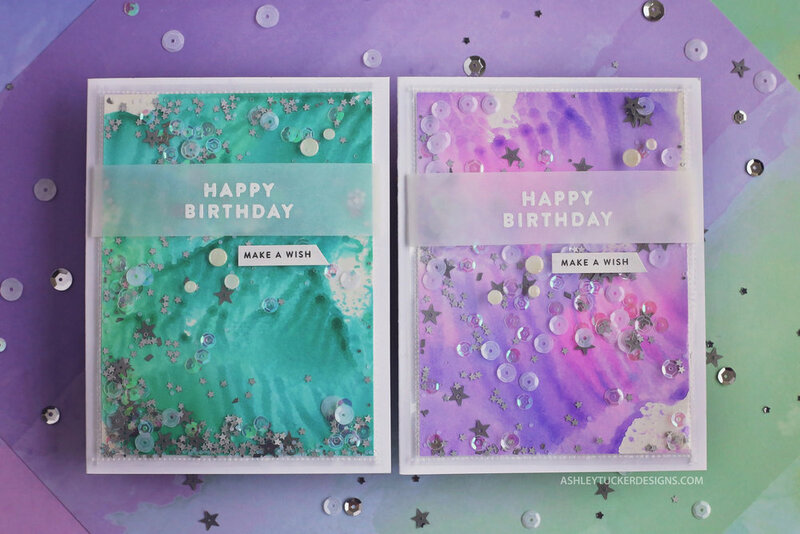 I stamped a lot of the sentiments by using two different colors of ink to create an ombre look. 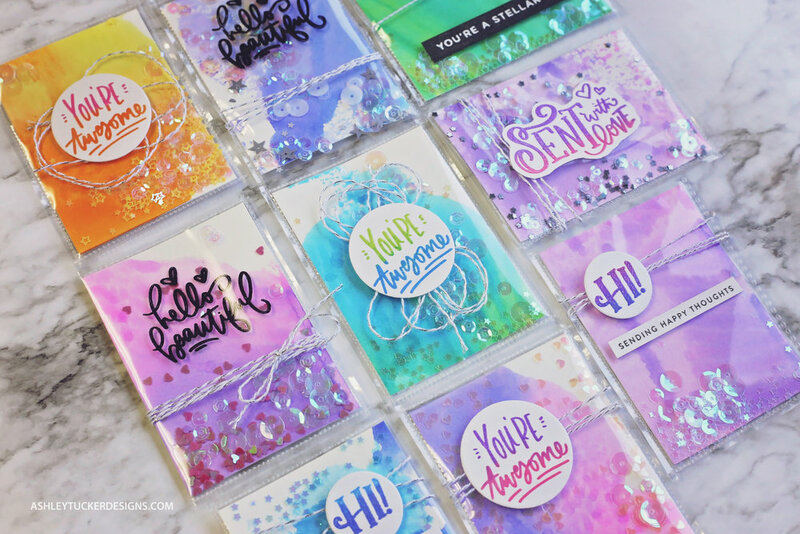 I then went over those sentiments with Icicle embossing ink. I got most of the sentiments that I used from the Super Sentimental stamp set from Brutus Monroe. I added silver twine in fun ways to each of the ATCs. For a couple of the cards I added additional sentiment strips. I went over those strips with Wink of Stella glitter to give them some sparkle. This is the final bookmark in the series of bookmarks that I made for my friend Joey. I decided to do another galaxy for this one but with lots of purples instead of multiple colors. I really liked the way that this turned out, it is a little sad that I couldn't keep it. Luckily I have half of the galaxy I created leftover so I could make another one for myself if I want to.